Use this pot to hold candies, erasers or any other goodies you like. Makes a great gift for teachers! It should be just large enough to fit on top of the pot. When the girls were younger, I'd basecoat a bunch of pots with white acrylic paint (and sometimes even leftover gray fence paint *grin*) and then let them paint over top of that with poster paints. The terra cotta color is tough to cover with poster paints. By basecoating white, it makes the process go better for them. bright red (or yellow if you want a golden apple). light yellow (or white) for the chalk writing (or use a acrylic white paint pen). Paint the terra cotta pot red. You can just paint the outside or you can do the inside too (we just did the outside). Let dry (if using acrylic paints, the paint will be dry before you're ready for the next step with the pot). Paint the bottom of the saucer the same color red. Again, you can paint the whole thing red if you prefer. Paint a black square onto the front of the pot (to look like a chalkboard). You can use low tack masking tape to tape off the area you'll be painting if you want to be really exact, but we just did it free hand. I drew a line with black marker and then Tasha (my 8 year old) filled it in. Cut leaf shapes from fun foam or construction paper and glue them on. Tie the raffia or ribbon into a bow and glue that on top of the leaves. 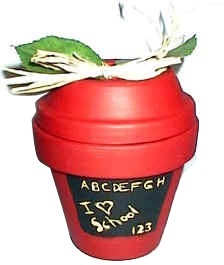 Use a small paintbrush to paint school messages onto the chalkboard. Some suggestions are ABC's, 123's, I Love School, stick figures, the teacher's name, the child's name or a picture of an apple. (Depending on what you decide to put on your chalkboard, younger children may need help with this step). Fill with candies, paper clips, push pins small erasers to give as gifts to children and place on desk (or give to the teacher as a gift). NOTE: If the hole in the bottom of the pot is too large and lets the candies out the bottom, trace the pot bottom onto a piece of red construction paper or fun foam. Cut about 1/4 inch inside the circle you traced and slip the circle inside the pot so it blocks the hole.